The Moultries, now Lords of both Markinch and Seafield near Kinghorn, entered into a bitter feud with their Kirkcaldy neighbours, the Melvilles of Raith. Street brawling between the two families and their supporters was not uncommon and even James V had to intervene on one occasion to keep the peace. Balfour House had by now passed through marriage to the Bethune family (also known as Beaton). At the beginning of the century John de Bethune was appointed Lord High Treasurer of Scotland and later this family provided one of the four Maries referred to in the song about Mary, Queen of Scots. But the Reformation was in progress and the family's fortunes turned when Cardinal David Beaton was murdered, following the execution in St. Andrew's of the Protestant preacher George Wishart. This incident was to trigger the downfall of Catholicism in most of Scotland. Markinch Church was taken over by the Crown around 1560 and has had a Protestant congregation of one form or another ever since. 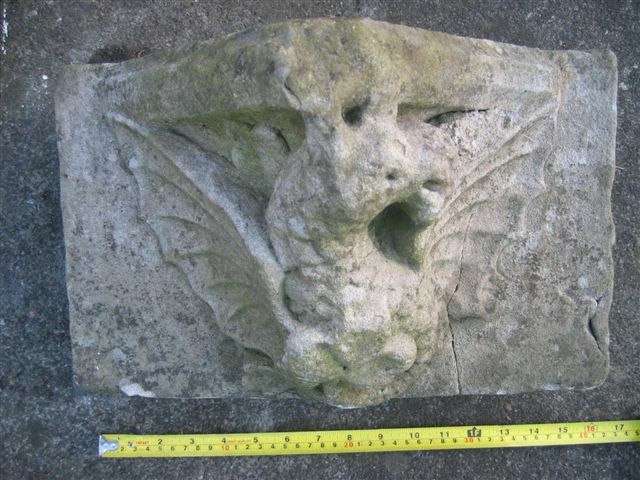 Medieval "stoups" or holy water basins are built into the churchyard's southern retaining wall and a beautiful carving of a dragon from the pre-Reformation church has recently turned up in a neighbouring garden (above). The 17th Century saw the estate of Balgonie in the hands of the Covenanter and mercenary Sir Alexander Leslie. He was created 1st Earl of Leven by Charles I in an attempt to placate him but he nevertheless led an army that defeated the king at Marsden Moor. Later in the century a branch of the Balfour family bought Balbirnie and a link between the place and that family has lasted down to the present day. Religious strife continued to tear the country apart for the rest of the century and Markinch ministers were regularly falling in and out of favour with the authorities, depending on the strength of their Episcopalian or Presbyterian sympathies. Charles II granted Markinch the status of a Burgh of Barony in 1673, linked to the title of John Law, a firm royalist at that time who held the estate of Brunton and Dalginch. 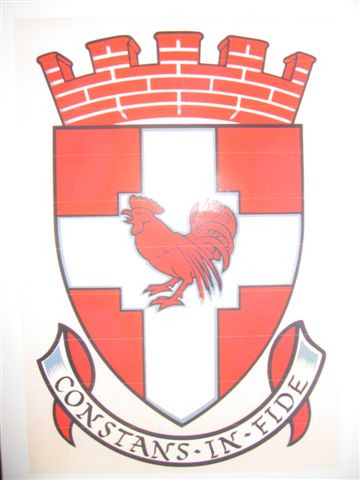 His coat of arms portrayed two red cockerels and the bird came to be displayed on the town's heraldic shield (see above). The motto "Constant in Faith" (Constans in Fide) proved to be over-optimistic because, within less than 20 years, the Episcopalian regime of Charles had been supplanted by William of Orange. William's staunch supporter, Lord Melville, a descendant of the Moulray family's old adversary, Melville of Raith, acquired Markinch and the Brunton and Dalginch Barony for his son David. Within a few years, the entire landholding fell into the hands of the Earldom of Leven through a marriage contract between the Leslies and the Melvilles. By now Markinch had the right to trade and prospered thanks to the weekly fair. More houses were built, mostly thatched and huddled around the kirk next to the market cross. Almost all of these, once recognisable by their steep, often crow-stepped, roofs, have now been replaced by later Georgian and Victorian buildings.